Be the first to share your favorite memory, photo or story of Doris . This memorial page is dedicated for family, friends and future generations to celebrate the life of their loved one. 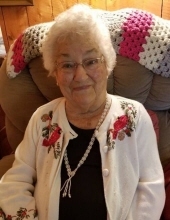 Doris Jean Benefield Clark of Forts Lake, MS was welcomed into heaven on January 29, 2019 at the age of 87. She was reunited with her high school sweetheart and beloved spouse of 49 years, James Eugene Clark. Doris Jean was born in Kreole, MS on October 11, 1931. As a child, she spent time at her grandparents’ homes exploring the local marshes and fields. She graduated from Moss Point High School and married in 1949. Shortly after she married James Eugene Clark, she became a devoted member of Kreole United Methodist Church. Doris Jean taught Sunday School and played the piano throughout her long life. After losing James to a tragic accident, Doris met and married Jim Seay of Grand Bay, AL. She enjoyed being outdoors gardening, fishing, and exploring on her golf cart. Hospitality was an important part of her life, whether drinking coffee with friends and family, or camping along the bays, bayous, and creeks with her children, parents, siblings, nephews, and nieces. She also was an experienced seamstress and practiced crafts such as pottery, ceramics, and painting. An excellent cook, pound cake and pecan pie were frequently found on her sideboard and no one ever left her table hungry. Doris Jean was predeceased by her first husband, James Eugene Clark; mother and father, Anice and Herbert Benefield, Sr; sister, Shirley Mahathy; and daughter-in-law, Connie Clark. Surviving siblings include Elaine Graham, Joann Hopkins, and Herbert (Peggy) Benefield, Jr. She enjoyed having her six children stop by for visits, meals, or even brief chats. Her children are Austin (Wanda) Clark, Bob (Judy) Clark, Denise (Michael) Lewis, Lisa (Ashton) Cannon, Annette (Darrell) Stringfellow, and Glenn (Shani) Clark. She was especially proud of her eight grandchildren, Michael Clark, Brad (Angelia) Clark, Jason (Colette) Clark, Brooke (Eric) French, Cristin (Michael) Ford, Danlee (Nik) Budney, Anice (Alex) Goff, and Johnny Clark. Her family also included ten great-grandchildren, Cameron (Jackie), Mitchell, Matthew (Victoria), Joshua (Curie), Wesley, and Jason Clark, Bradford Quinlivan, and Hudson, Alec and Jake French. She also has one great-great-grandchild, Annabelle Clark; along with a host of nieces and nephews. Memories of her will be cherished by all. Pallbearers will be Jason Clark, Cameron Clark, Mitchell Clark, Joshua Clark, Matthew Clark, and Ricky Benefield. Honorary pallbearers will be Ashton Cannon, Michael Clark, Brad Clark, Johnny Clark, and Alex Goff. Visitation will be held on Friday, February 1, 2019 from 10 a.m. until 11 a.m. at First Baptist Church of Grand Bay, 10170 Grand Bay Wilmer Road South, Grand Bay, AL. Funeral service will begin at 11 a.m. with Brother Tim Cauley and Dr. Royce L. Dubose officiating. Interment will immediately follow at W. R. Clark Cemetery in Forts Lake, MS. Following graveside, all are invited to return to the Parten Building at First Baptist Church of Grand Bay for a meal and fellowship. To send flowers or a remembrance gift to the family of Doris Jean Clark, please visit our Tribute Store. "Email Address" would like to share the life celebration of Doris Jean Clark. Click on the "link" to go to share a favorite memory or leave a condolence message for the family.